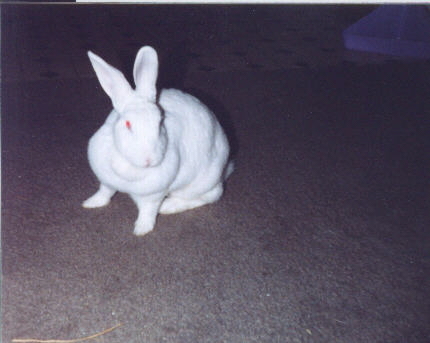 The brilliant white hopper is eating grass on the other side of the Rainbow Bridge right about now. I know this because I left her lifeless body at the vets office, after having helped her cross. It sure doesn't feel like much, nor do I feel this great sense of accomplishment for having done the responsible thing. In fact, it doesn't feel like anything at all. It just hurts a bunch. She had a mammary cancer that had mushroomed out into both sides of her chest. She was starting to breathe hard (pant) and it was time for her to go home. could have made a meal from them. She lived with us for 4 and a half years, she was 3 or 4 when we got her and had been living under a church as a feral rabbit for almost 3 of those years before us. I discovered Lilly one morning when she came out to sun herself 6 months before I took her. In the meantime I attempted to educate her caregivers about rabbits until one day I found her under the feet of 20 girl scouts running thru the churchyard with another 20 or so parents standing around and talking while Lilly was underneath them just relaxing. Of course anyone who knows about rabbits knows something is terribly wrong with that picture. She had endometriosis so bad she was dying and almost did at the hands of a very competent surgeon, but we got her back, and she came to live with me right after my ex wife threw us all out of our home and we went to live in my mother's house for 4 months til we found our own place. At the time I was so sick, all I could do was work a split shift to support us, at that time, I would come home at lunch time and lay on the floor with Lilly and rub her while I napped. Lilly would sit there til I fell asleep, or she was satisfied that I rubbed her well enough (sometimes hours). When there was a big scare of mycotoxins, we got a bag of Kaytee rainbow exact, and halfway thru the bag we found fuzzie, and mold and Lilly got sick. Thanks to PB and all the threads, I knew what to do ,even before she became symptomatic and she was flushed out, even before she got symptom number 1. That was my Lilly Puddin', my brilliant white hopper. GOD knows how much I've loved her. I love you and already miss you Lil'Puddin'.